« Return to our Altador Cup Coverage! Slushie Slinger is one of the side games in the Altador Cup, meaning that it's just another way of earning points for your team. Score at least 270 points in a game, and your score will contribute to increasing your rank! A maximum of 86 games per day can be played that increase your rank and score. Playing is very simple. You control the Tuskaninny waitress with the arrow keys: use the left and right keys to face either the slushie machines or the counters, and the up and down to move, well, up and down. 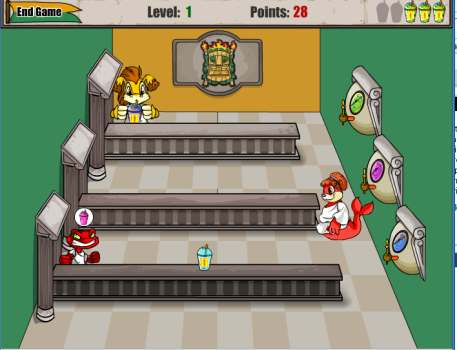 Press the space bar in front of a machine to fill a slushie cup or to place a newly filled order on one of the counters. How do you know what your customers are ordering? Each customer appears with a thought bubble containing an image of which flavour slushie they would like to receive. There are three flavours, marked by three different colours: green, pink, and blue. Your job is to give each customer the correct slushie before that customer reaches the end of the counter. You can give them the wrong slushies, but you'll get fewer points. Last, but not least, you need to make sure you clean up after your customers so the counters are ready for new ones. This means picking up the empty slushie cups after your customers are done with them. To do this, simply stand at the end of the counter, facing the counter . You'll pick up the empty cup, no worries. You get five lives, marked by the little slushies at the top right of the screen. You'll lose one if a customer reaches the end of the counter without receiving a slushie (any slushie--you won't lose a life for giving a customer the wrong flavour), or if an empty cup falls to the floor. You'll also lose a life if you send a slushie down a counter with no customer waiting at the other end. The level of the game will increase after every 50 points that you earn, meaning more customers who will slide down the counters ever faster. (Thanks to fanfly for telling us about that). Your contribution to your team is based on how much you score in this game (but it can't bring your team's score down, so submitting the minimum score to receive credit is much better than submitting nothing for the day). Furthermore, one Slushie Slinger play is equivalent to half a Yooyuball win when it comes to calculating your rank. As Mooeena points out, the length of the counters isn't just due to the odd perspective of the game window. Empty slushie cups being sent back down the top counter will reach the end and fall off faster than cups sent back along the bottom counter. What does this mean? If you've got multiple slushie cups that appear to be travelling in a perfect vertical line, simply start at the top counter and work your way down--you'll catch all the cups, no sweat. It's when they're shifted slightly diagonally from top right to bottom left that you need to watch out. In the later stages of the game, when you have more customers and they move much more quickly, it's useful to remember that you can give them the wrong flavour if necessary. It's better to give them the wrong one and score fewer points than it is to lose a life for not serving them at all. (Thanks to Sakshi for pointing that one out). In fact, you may find that after a certain level, you need to serve only green slushies to the top counter, pink to the middle, and blue to the bottom to make your movements faster. It is also worth noting that you are able to pick up empty slushie cups even when you have a filled slushie in your hands, as long as you are facing the right direction. This is a huge time saver, since you'll be able to consolidate two full steps into one smooth motion. Fun fact: the slushie flavours served by the AC vendors are zeenana, jumbleberry, and chokato. You may also find it more efficient at the latest levels you can manage to serve every customer in a single row, then move down a row and serve every customer, etc., instead of serving the customers closest to the ends of the counter. This will save you the up and down movement time. Keep in mind when you're using these late-level tricks where you have to cut corners to make your life easier, that you'll get progressively better as you play more. You'll want to keep pushing yourself every so often to see if you can make it one more level without having to use the shortcuts--it'll mean prolonging your game that little bit more. Good luck slinging those slushies--you'll need it!